Blues notes shrouded in shades of light sadness and artistic musical trends envelop thoughtful vocal reflections of the Man With a Stick composition, starting Fish - A Parley With Angels album thoughtful romanticism, bringing vocal phrases to the fore and creating a bewitching atmosphere of musical sacrament. During the Little Man What Now introduction romanticism removes sadness, complementing vocal reflections with acoustic guitar passages, introducing symphony with keyboard and violin passages. 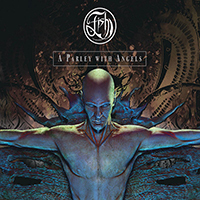 It should be noted that this saga appears to be a completely completed musical creation, creating the musical atmosphere of one’s own world - juxtaposing folk elements, and epic influences of bardic legends and artistry of the progressive layout of the many elements of this fascinating composition. After the vocal part is completed, the composition is completed by the interlacing of artistic musical lace and orchestral suites, creating an indescribable charm, in which you want to plunge again and again. Thoughtful romanticism brings to the forefront of the Waverly Steps musical composition a saxophone part leading its own musical wave, interlaced with vocal experiences and fascinating gentle romanticism with hints of sadness and symphonic orchestral background. Weaving a fascinating lace of cosmic trends from guitar and keyboard passages Circle Line song complements the sound of the support of fans at a live concert, in the main part of the composition, he lines up the narration by alternating male and female vocals, weaving their phrases in a chorus in duet. Continuing the atmosphere of a live concert begun in the previous composition, the brooding State Of Mind ballad rolls out the composition canvas, trusting vocal phrases dominant role in the compositional structure. Complementing the musical canvas with new and new shades, the artistic ballad turns into a kind of spiritual anthem. The introduction of the Yoyeur song brings together fascinating whirlwinds of fascinating passages, drawing into a playful and charming dance, supplementing the reflections of male vocals with soft and gentle phrases of female and playful musical covers. The final part of the composition is based on the dialogue of male and female vocals. The album is completed with the Emperors Songartistic composition, intertwining fabulous trends and intriguing melodic decisions, enveloping vocal reflections, in which the male vocals predominate, set off by the sensual vocals of the female.